Virtual COM Port (modem) interface allows standard fax or voice software to communicate with VoIP phone lines. It is a bridge between your fax or voice software and VoIP. The figure below shows how this works. Fax Voip creates software virtual fax-voice modems using virtual serial ports technology. All created virtual modems are mapped to Virtual COM Ports in your operating system. Virtual modems fully emulate real hardware modems and duplicate their functionality. Virtual modems work exactly as real ones (supporting Hayes AT commands). You can operate them in a usual way. The main thing is that instead of using conventional telephone line modems created by Fax Voip use VoIP network (SIP, H.323) or ISDN network (CAPI 2.0). You may set up and use Microsoft Fax service or any other third-party application to send/receive faxes or/and voice messages via VoIP without hardware modems! What kind of license do I need to use this? To use Fax Voip with Microsoft Fax service or any other third-party fax voice application you need Fax Voip T38 Fax & Voice Virtual COM Ports (modems) license. How to configure my fax (voice) software? 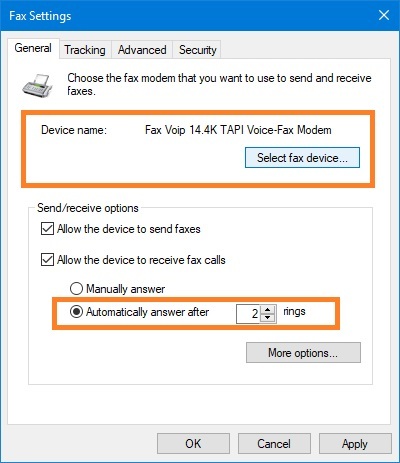 Select the Fax Voip 14.4K TAPI Voice-Fax Modem device in the settings of your fax (voice) software. Depending on your software, you may need to specify the serial port instead of a modem. In this case, select the port associated with Fax Voip e.g. COM20. To receive incoming faxes or / and audio messages, you usually need to configure your software to automatically answer incoming calls. To send and receive faxes or / and audio messages and to use other functions, see documentation to your software. A complete set of functions that you can use depends on the capabilities of your fax (voice) software. Typical features are: answering machine, fax to e-mail, remote access to fax and voice mailbox etc. How to configure Fax Voip to use Virtual COM Ports (modems)? To make outgoing calls via Virtual COM Ports (modems), i.e. 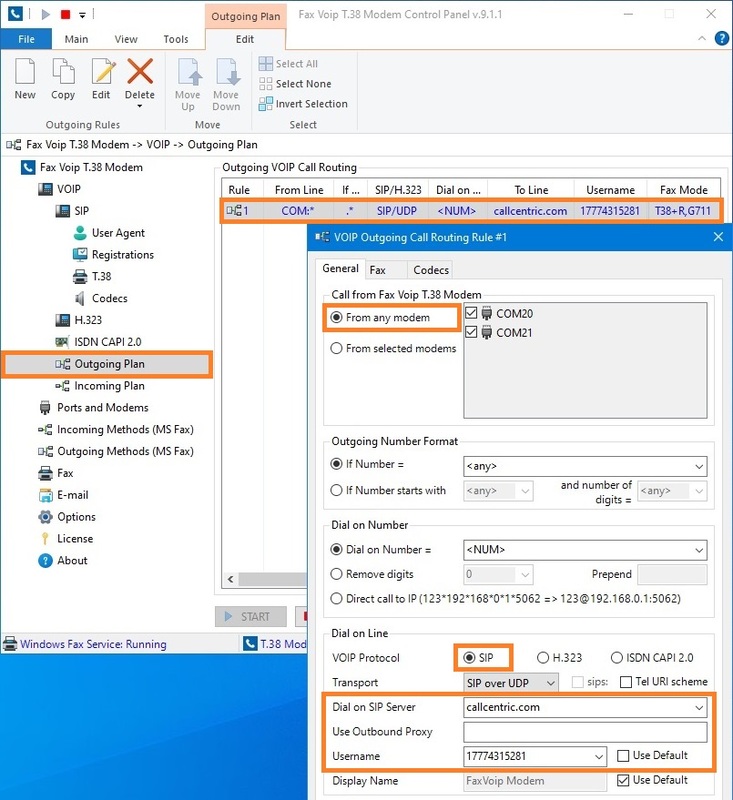 via standard fax voice software, you must configure outgoing rule for this type of calls. COM:* should be specified in the From Line field of your rule. To route incoming calls to Virtual COM Ports (modems), i.e. to standard fax voice software, you must indicate this in your incoming rule. line:<NUM> should be specified in the To Fax Voip field of your rule. 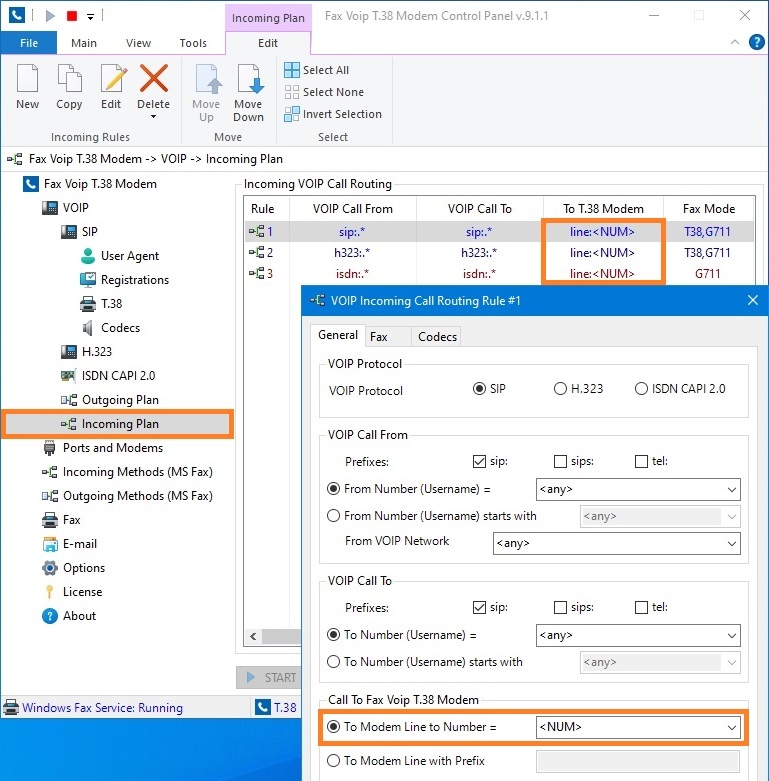 Note that by default Fax Voip routes all incoming calls to Virtual COM Ports (modems), so you usually do not need to re-configure incoming rules after clean installation.